Don’t be intimidated to prepare this cake. Key is being organized and following the various steps. The outcome is a delightful, delicious, decadent cake that is sure to impress. The recipe for this cake is from allrecipes.com, a definite keeper with the cake turning out excellent. Watching the video on their site will put away any fears and give you the confidence to create this masterpiece. First, the cherry filling is prepared with cherries (I used fresh ones from our tree), sugar and cornstarch. Heated for the sugar to melt and mixture to thicken. Set aside to cool while the chocolate sponge cake batter is mixed, divided and baked into two cakes. While the cakes are cooling, in a chilled bowl, whipping cream is whipped with sugar till stiff, which is sandwiched in between layers of the cakes along with the cherry filling. 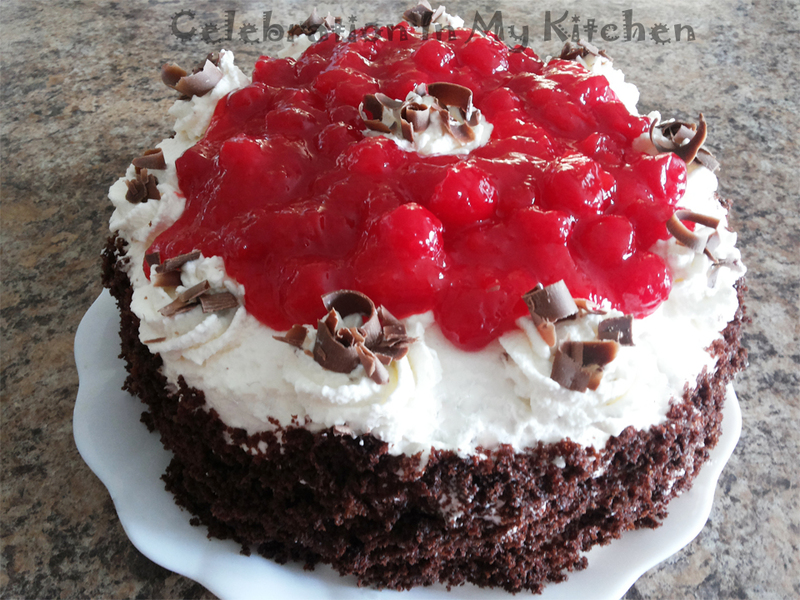 The entire cake is frosted with additional whipped cream, decorated with maraschino cherries and chocolate savings. Refrigerated and eaten when cool, the cake is moist and sure to satisfy your sweet tooth. The cake gets its name from the Black Forest area in Germany and showcases the main crops; cherries. 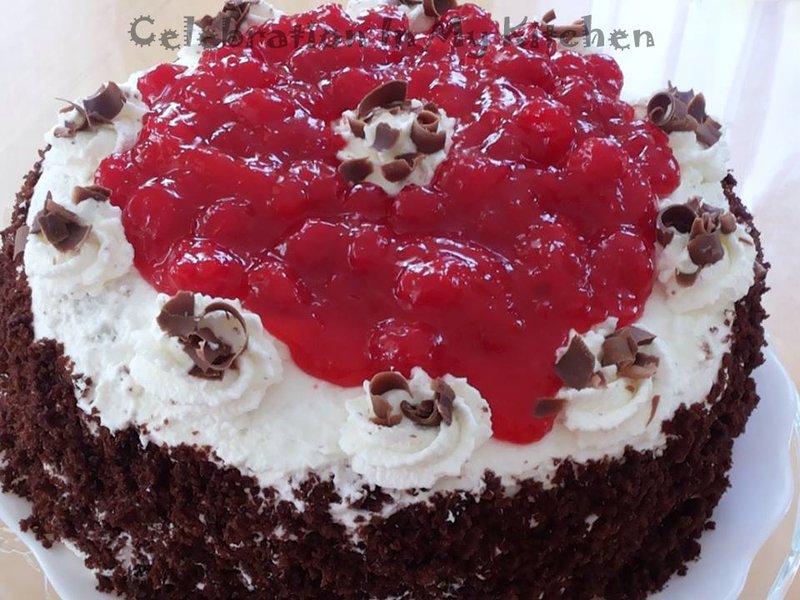 Some historians feel that the cake is named after the traditional costume worn by the women in the Black Forest, which was black (resembling the chocolate flakes), white blouse (like the whipped cream) and a hat with red pom-poms that looked like cherries. Traditionally, kirschwasser or kirsch, a clear spirit made from sour cherries is added to flavour the cake. Rum is often substituted for kirschwasser. In America, 28th March is considered a National Black Forest Cake Day. Preheat oven to 350 F or 175 C. Grease and flour two 9” round cake pans. Line the bottom of the pans with parchment paper. Sift the dry ingredients; flour, cocoa powder, baking powder, baking soda and salt. Using an electric hand beater, beat the eggs with sugar and slowly incorporate the oil. Add the dry ingredients alternating with the milk and vanilla extract until well blended. Pour batter into prepared pans. Bake for 35 minutes or until a cake tester inserted in the centre of the cakes comes out clean. Wait for few minutes, then loosen edges and transfer cakes to a wire rack to cool completely. 2 1/8 cups flour is 2 cups and 2 tablespoons of flour. This chocolate cake is moist and delicious. Use the cake batter recipe to make chocolate cake with your favourite icing. Drain cherries, reserving 1/2 cup juice. Combine the cherries, reserved juice, sugar and cornstarch in a saucepan. Cook over low until thickened, stirring constantly. Add vanilla and set aside to cool completely. 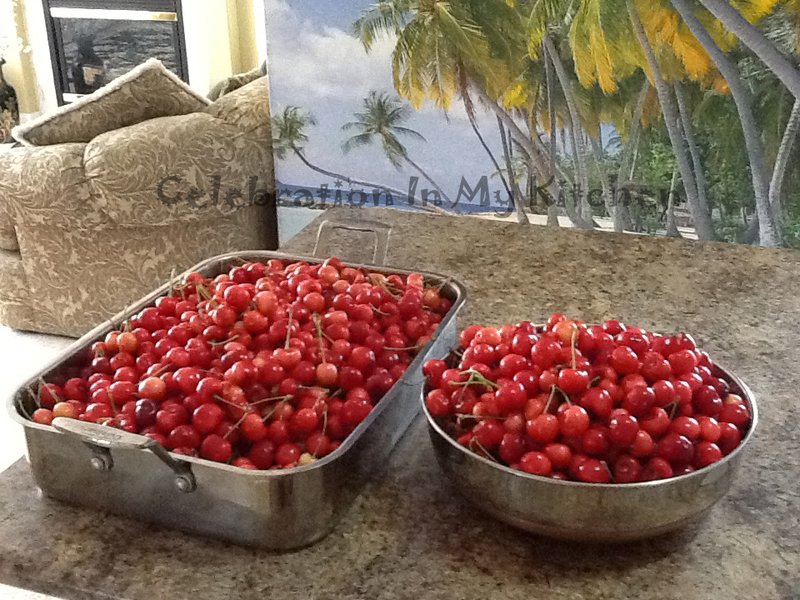 I used 2 1/2 cups of fresh firm sour pitted cherries from our garden cherry tree - see picture below. Add sugar depending on the sweetness of the cherries. Accordingly, reduce or increase. If you wish to add kirsch (cherry liqueur), then made a syrup out of 1/2 cup reserved cherry juice, 1/2 cup sugar, cornstarch, 1/4 cup kirsch and cherries. Omit the vanilla extract. Prepare the syrup first and add cherries at the end to maintain their structure. In a chilled bowl, combine whipping cream and confectioner's sugar. Using a stand mixer or an electric hand beater, beat cream till stiff peaks are formed. With long serrated knife, split each cake layer horizontally in half. Tear one split layer into crumbs; set aside. Reserve 1 1/2 cups whipped cream for decorating cake. Set aside. Gently brush loose crumbs off top and side of each cake layer with pastry brush. To assemble, place one cake layer on cake plate. Spread with 1 cup cream and top with 3/4 cup cherry filling. Top with second layer of cake. Repeat layers of cream and cherry filling. Now place the third cake layer. Frost the top and sides of cake. Pat reserved crumbs all around the sides. Before you start with the cake, first place a bowl in the freezer to chill for whipping the cream. Then prepare the cherry filling and set to cool. The cakes can be prepared, baked and cooled. While cakes are cooling, whip the cream. 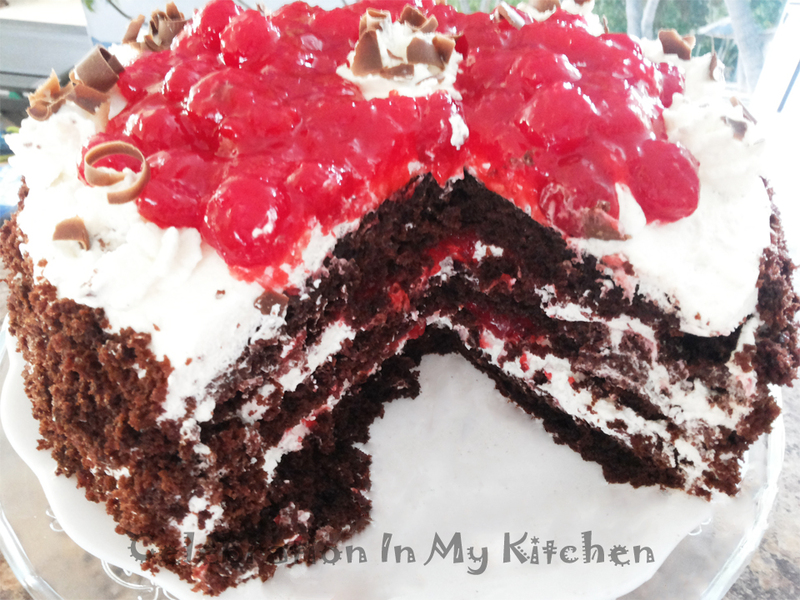 I sandwiched the entire cherry filling in between the cake layers. Decorated the top of the cake with maraschino cherries, 375 ml, which was thickened with some cornstarch and no sugar.